Whether you want to be a professional or an amateur web developer you need to know HTML, and that means understanding all the HTML 4.01 tags. Yes, you will have heard a lot about HTML5, which is a set of extensions to standard HTML 4.01, providing cool new features like audio and video without needing a plug-in. But in order to use HTML5 (or any other web technology) you must first fully understand how to create web documents using HTML4. 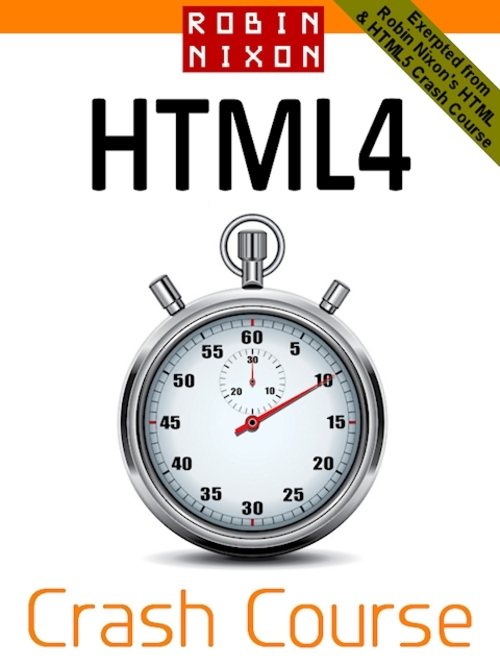 Learn HTML the quick and easy way with this super low price crash course. Set aside a couple of hours and you'll be able to read this book in one sitting, and be building your own websites straight away. * Each Lecture begins by listing the three key skills you will learn. * A summary at the end of each lecture reminds you what you have learned. * Useful, fully-tested examples illustrate every tag, attribute and function. * Each lecture features several notes providing extra, handy advice. * The examples can all be downloaded from the companion website. Robin Nixon: HTML4 Crash Course html;html4;website 198690714 4.99 robinnixon Fresh Download Available!